Description: Christians have been interpreting Scripture with an aim of deepening their life with God and each other from the very beginning of the church. The past twenty years or so have witnessed an explosion of scholarly writing devoted to the theological interpretation of Scripture. Stephen Fowl, as an active participant in and contributor to the burgeoning literature, has written an ideal companion for guests at the ""large and somewhat chaotic party,"" introducing them to important people, texts, and issues. The companion explores some of the connections between the long-running and essential Christian practice of theological interpretation and the more recent body of scholarly literature. Ultimately, the companion hopes to encourage readers to join the party in their own right. 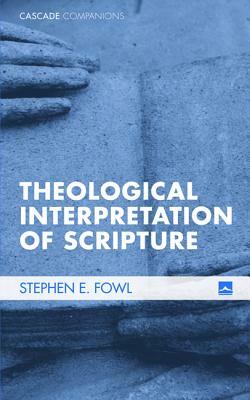 Endorsements: ""Steve Fowl has been both a pioneer and a leader in the return to theological interpretation. In this concise book, he offers us a truly theological and ecclesial account of theological interpretation. It is an inspiring, liberating, and practical work, encouraging all Christians to interpret Scripture so as to find our proper end in ever-deeper communion with God and one another in anticipation of the fullness of God's reign."" --Michael J. Gorman, author of Reading Paul (Cascade Books) and Inhabiting the Cruciform God ""In this brief companion we find a focused, clear account of major themes in Steve Fowl's approach as well as gracious interaction with the work of others and numerous illustrative appeals to Scripture itself. This is definitely a case in which less is more: attention to this little book will prove very fruitful for engagement in biblical interpretation as a theological practice."" --Daniel J. Treier, author of Introducing Theological Interpretation of Scripture: Recovering a Christian Practice ""Fowl here plays the role not only of companion but guide and host in this clear and compelling introduction to the most important turn-of-the-twentieth-century development in biblical interpretation. He argues that Christian readers should interpret the Bible with an overriding interest in God's interest in using the Bible to promote communion. He practices what he preaches: he is generous towards those with whom he disagrees and gives fair descriptions of other approaches to theological interpretation."" --Kevin J. Vanhoozer, general editor of the Dictionary for Theological Interpretation of the Bible ""Stephen E. Fowl's latest, Theological Interpretation of Scripture, displays gems in the treasure trove of the new-yet-venerable task: reading the Bible as Scripture of the Church. Fowl helps us to think theologically about reading Christian Scripture as the living voice of God. Fowl invites us into a 'cocktail party' with his conversation partners in this renewal of reading sacra scriptura for the Church's life and witness. Entirely accessible, thoroughly convincing, with a sense of adventure and hope. May his tribe increase --Rev. Kathryn Greene-McCreight, author of Galatians in the Brazos Theological Commentary Series (forthcoming). About the Contributor(s): Stephen E. Fowl is the Chair of the Department of Theology at Loyola College in Maryland. He is the author of several books, including Engaging Scripture: A Model for Theological Interpretation (Wipf & Stock, 2008); Reading in Communion: Scripture and Ethics in Christian Life (with L. Gregory Jones; Wipf & Stock, 1998); and the Two Horizons commentary on Philippians.